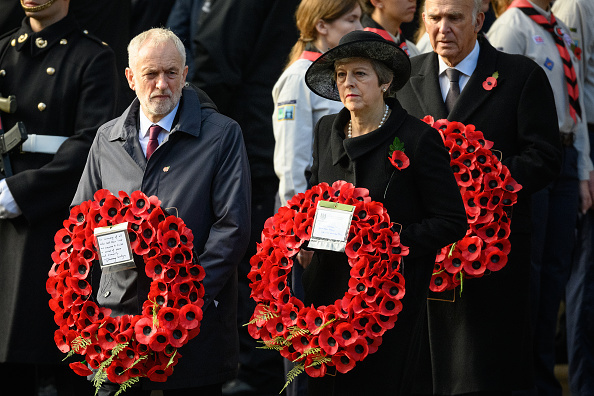 New York Observer columnist, Andre Walker, has claimed an anorak worn by Jeremy Corbyn to a Remembrance Day event was "deliberately disrespectful". The Labour leader wore a navy hooded anorak and poppy pin to a memorial event at the Cenotaph at Whitehall, which was also attended by Theresa May, Gordon Brown and Tony Blair. Mr Walker claimed wearing the anorak was "grossly disrespectful", adding that Mr Corbyn "has never been a supporter of the British military". "He was the only person whose coat was ever going to get noticed," Mr Walker told Julia Hartley-Brewer. "A lot of people have suggested that this is some sort of a gaff or whatever, or him just being generally disrespectful. I actually have a rather more sinister view of it. I'm sure it's something that's absolutely deliberate. Jeremy Corbyn has never been a supporter of the British military. "I think what he has done is deliberately been disrespectul and then offered a fairly perfunctory excuse for it. "This is a man who I believe is pathologically obsessed with the view that his supporters are anti-war, anti-military, hate the Remembrance Sunday event and will want to see him being disrespectful. Obviously he can't admit he's being disrespectful but I think the message is clear to his supporters." Mr Walker added the Labour leader should have purchased a smarter coat, claiming his failure to do so suggested he "hates the military" and the "people who have sacrificed themselves for this country". "These long black coats that people tend to wear at Remembrance Sunday used to be very expensive. Nowadays you can pick them up for £60 to £70. "It's not as if he was incapable of buying one, and it's not as if he mustn't have been aware of the Michael Foot incident. And it's not as if he didn't know that his clothing was going to be scrutinised."